In this Jan. 4, 2019, file photo, Rep. Jerrold Nadler, D-N.Y., chairman of the House Judiciary Committee speaks to House Democrats, now in the majority, during an event at the Capitol in Washington. The House Judiciary Committee on Wednesday voted 24-17 to authorize a subpoena for the full, unredacted report by special counsel Robert Mueller on Russian interference in the U.S election and alleged obstruction of justice by President Donald Trump, NBC News reported. The committee took the action after Attorney General William Barr told Congress that he intends later this month to provide a report to lawmakers with certain material removed. 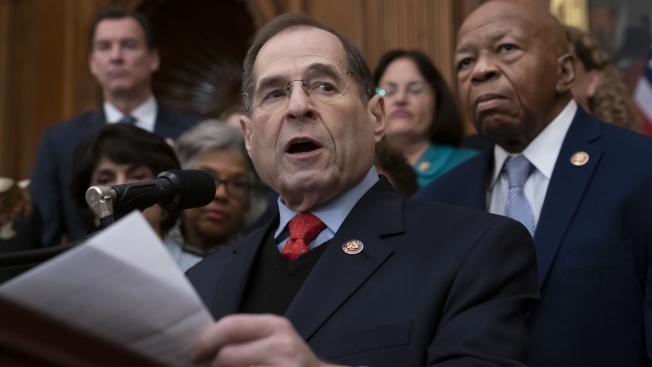 The subpoena for the nearly 400-page report, along with underlying documents, will not be issued until that is approved by Judiciary Committee Chairman Jerrold Nadler, D-N.Y. The resolution calls for the final Mueller report as well as “any accompanying exhibits, annexes, tables, appendices, other attachments and all evidence referenced in the report” as well as “underlying evidence collected, materials prepared, or documents used by” Mueller’s office. The measure also authorizes the committee to issue subpoenas for documents and testimony from five individuals: former White House counsel Don McGahn, former Trump adviser and White House strategist Steve Bannon, former White House communications director Hope Hicks, former White House chief of staff Reince Priebus and former White House deputy counsel Ann Donaldson.